Mayi Moulin is something I grew up eating. My mother combined it with a variety of things. Mayi moulin ak sos pwa (with bean sauce), mayi moulin ak pwa (mixed with beans), mayi moulin ak aranso (with smoked herring), mayi moulin ak pwason (with fish), and of course, mayi moulin ak zaboka (with avocado). If you name the typical Haitian combination, I've most likely had it before. My favorite combination is with fish sauce and avocado, which is what I was preparing this one for. Mayi Moulin is also one of those things that is best eaten fresh, just like "bannann peze". If it sits or you have it as leftovers, its consistency hardens and it's not the same. But hey, some people like it like that. This recipe describes the basics of how to prepare this simple dish. 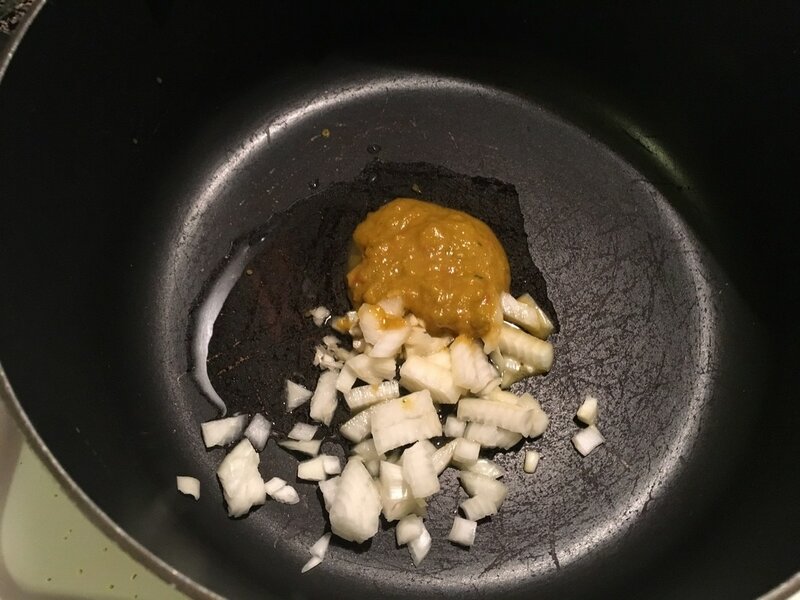 You can eat it alone or try combining it with other things like "sos pwa nwa" or even a fish sauce made with tilapia. 1. 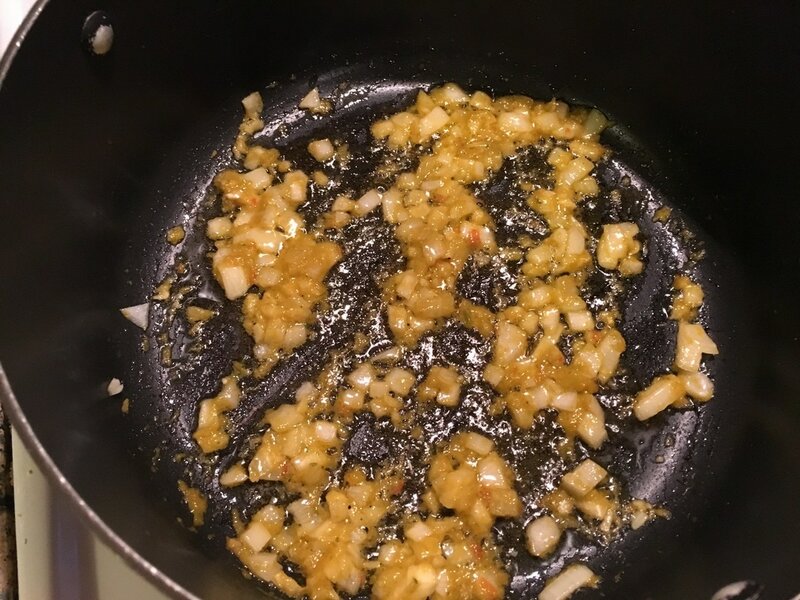 In a large pot, add 1/2 of a diced onion, 2 - 3 minced garlic cloves, 2 tbsps. of epis, and 1 - 2 tbsps. of vegetable oil. Saute on medium heat until onions become translucent, about 3 - 5 minutes. I used my aunt's version of epis which isn't as green as mines. The green epis works just as well. You'll just see the green specs of parsley and scallions throughout the mayi moulin when it's done. 2. 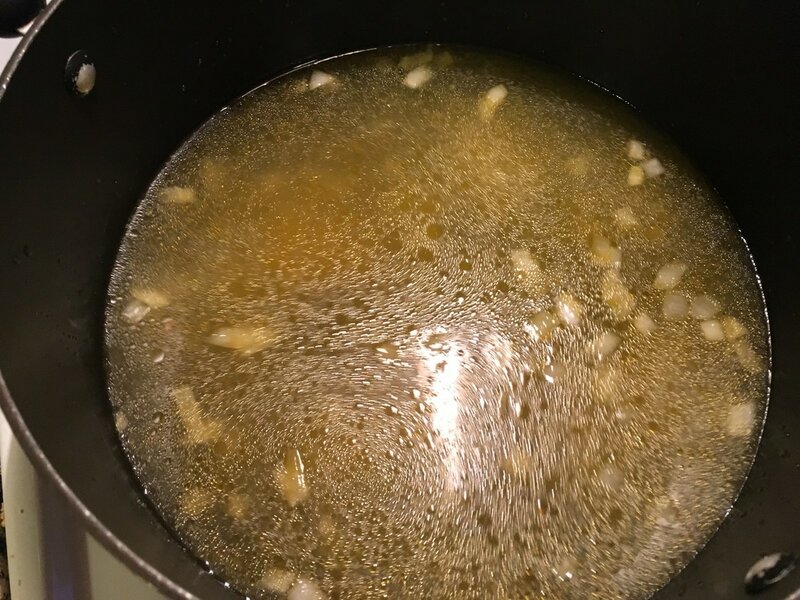 After sauteing, add about 5 - 7 cups of water and bring to a boil. You can start out with 5 cups and add more as needed, depending on how thick or thin you prefer the consistency of the mayi moulin. To the water, add about 1 tsp of salt. 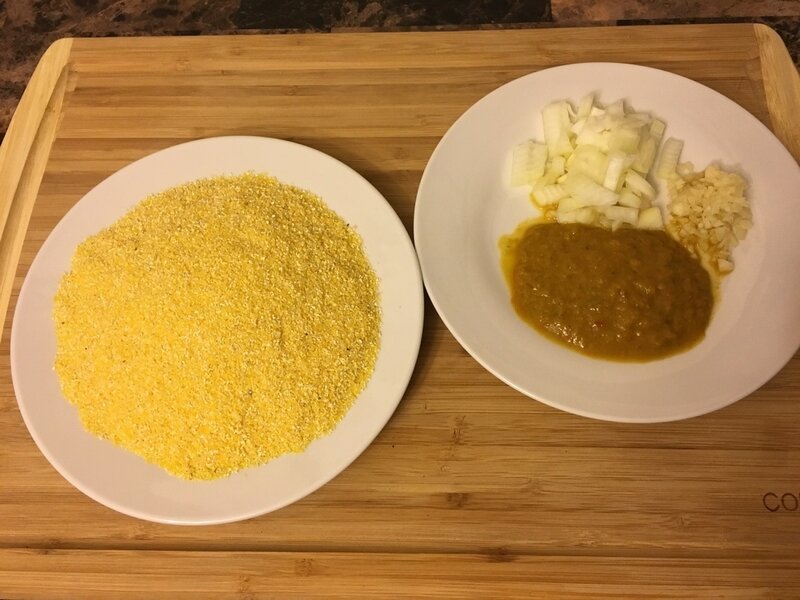 Then add more to taste in the next step once the corn meal has been added. 3. Once the water comes to a boil, sprinkle in the corn meal a handful at a time. I prefer sprinkling it in rather than pouring it because it helps to minimize the formation of lumps. As you add it in, be sure to stir it with a spoon. 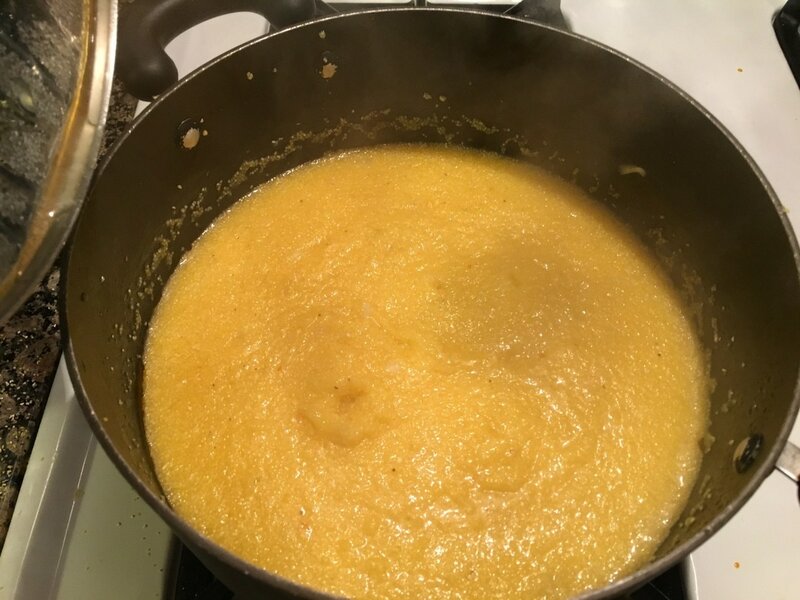 You'll be surprised at how quickly the corn meal absorbs the water. Turn the heat to low, cover the pot with its lid, and cook for about 15 - 20 minutes. Add more salt to taste if desired. You can add more water if necessary and continue to stir occasionally. You want to steam it as if you were cooking rice, except you'll be stirring every 2 minutes or so. 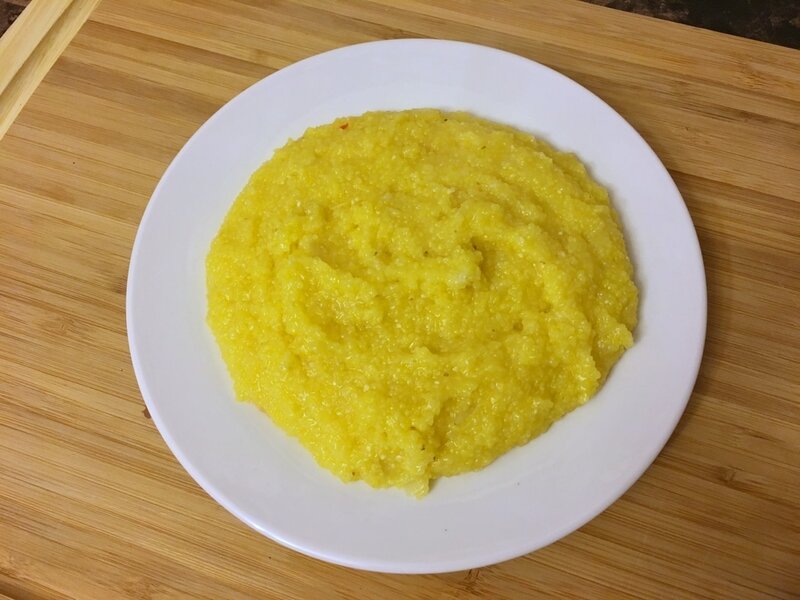 *You can decide if you want to rinse/wash the cornmeal before adding it to the pot. 4. About halfway throught the cooking process, add in about 1 - 2 tbsps. of butter and mix well until it melts and fully incorporates. Return the lid and continue to steam until done. What do you think of this recipe? What do you eat your mayi moulin with?